Fly Fishing for Trout in the Sacramento River near Redding has never been better. If you are looking for a Fishing Guide Service, call Greg Hector of Hookem Hecky's Guide Service at 530-515-5918. Greg has been fly fishing on the Sacramento River for 30 years. 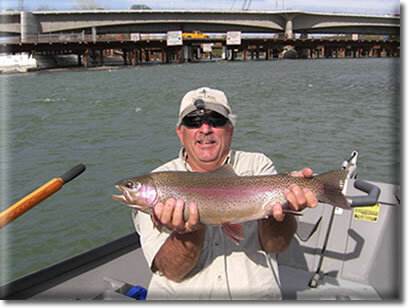 He provides a complete day on the water fishing for the Northstates favorite Rainbow Trout in the Redding Area. A variety of fishing trips are available Fishing trips start from the Posse Grounds in Redding and can end at Kutras Park, Bonneyview Boat Ramp or Anderson River Park. See more photos on Gregs Website: HookemHeckys.com. Greg also guides people on the Trinity River for people who are interested in catching Salmon, Steelhead or Trout. Greg, Thanks for a great time on the river. Man, what a beautiful day! Surrounded by mountains, Redding is the fly fishing mecca of northern California. That is why Greg Hector, of Hook’em Hecky’s fly fishing guide service calls this slice of heaven home. Located on the I-5 corridor, Redding is an easy 2 hour drive north of Sacramento. There are very few things finer in life than spending a day on the Sacramento River Fly Fishing. The Sacramento River starts its journey in Mount Shasta, California from a natural underground spring and flows down into Shasta Lake. From there it flows over the largest dam in California to create the Lower Sacramento River where fishing is excellent all year long. While most coastal and un-dammed rivers are blown out from rain very rarely does the Sacramento River between Redding and Anderson do so. 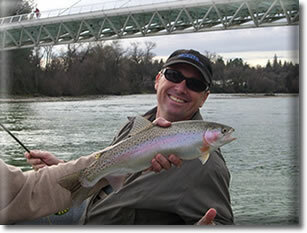 "Salmon - Trout - Steelhead Magazine" rated the Sacramento River "Best Wild Trout Fishing in California". It is not uncommon to hook a 24" trout with the average fish being 14-18". Fall through January; salmon are spawning. Enjoy egg drifting with a nymph or tandem eggs for catching trout. Try to get your egg through the salmon redds if you can avoid the wild spawning King Salmon you are sure to hook up on a beautiful wild Rainbow Trout. The Spring and Summer is dry fly time. Greg will do nymphing and dry flies. For the spin fisherman it is a great time of year to pull plugs or side-drift. The Sacramento river system is truly a diamond and your fishing guide Greg Hector will make sure it is a trip you will never forget. Whether you are looking for a professional fly fishing lesson or are a seasoned fisherman yourself seeking the ultimate thrill of landing a giant wild rainbow trout or steelhead, Hook'em Hecky's is the fly fishing guide service that you need.